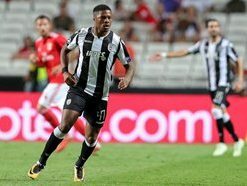 Former Arsenal striker, Chuba Akpom is currently enjoying a new lease of life with his new club, PAOK in the Greek Super League. The one-time Super Eagles invitee tallied his fifth goal in twelve outings as PAOK bested second placed Olympiakos 3-1 on Sunday, moving his club nine points clear at the top of Greek top flight. Nigeria manager, Gernot Rohr could sit up to take notice of the player before the 2019 Africa Cup of Nations.